Joan Cabanilles was cathedral organist in Valencia and the towering figure in Spanish organ music of the late 17th century. His brilliant and diverse musical language, rooted in the traditional sounds of Spain, has not managed to reach a large audience outside the Iberian peninsula, although he is often called "a musician of European stature". The aim of this three-volume Urtext edition is to grant access to his most appealing works. To this end, all available sources in the libraries of Astorga, Barcelona, San Lorenzo de el Escoreal, Felanitx/Mallorca, Jaca and Montserrat have been examined and newly evaluated. 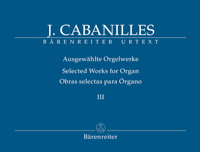 If Cabanilles?s oeuvre consists primarily of tientos, organ hymns and versets, the third and final volume contains three versos, three pasacalles, two galliards, two toccatas and such special forms as Paseos de tercer tono, Diferencias de Folías and a Jácara.